FREE again, just in time for Christmas. Now you can see what Santa is doing with Santa’s Home. The app is a “LIVE” feed of Santa’s house – the bedroom, the kitchen, the living room, his office/workshop, and the outside grounds. Kids can keep track of what Santa is doing up at the North Pole. I checked in on Santa a few times – first he was in the kitchen washing his dishes, then he was on the computer checking his list, and a little after 11 PM he was in bed snoring. The app even displays the correct date and time to make it seem more realistic. The app also gives adults the option of can subscribing to Santa’s newsletter. 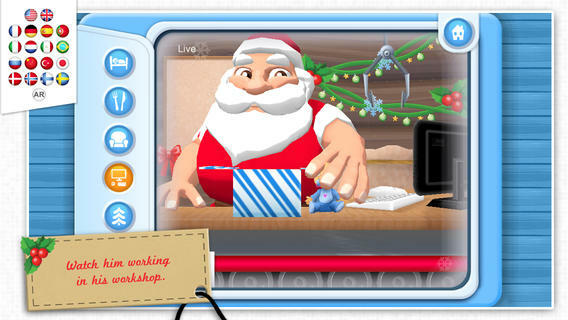 Adults can also help kids send Santa one of their drawings that he will display in his workshop. Super cute!! Teachers – This would be a fun one to use for creative writing!! It would also be fun for teaching prediction.